Once the largest distillery in the British empire, Gooderham & Worts Distillery was one of Toronto’s longest-running and most successful businesses. In 1831, founder James Worts immigrated from England and chose a half acre lakefront site near the mouth of the Don for the location of a wind-powered grist mill. Twenty-one metres in height, the windmill was a prominent local landmark until its demolition in 1859. Gooderham & Worts Distillery at Front and Trinity Streets, 1858. Note the five cattle sheds on the east side of Trinity Street, opposite the mill buildings. Source: W.S. Boulton and H.C. Boulton, Atlas of the City of Toronto and vicinity, Toronto: J.Ellis, 1858, Special Collections, TRL, Toronto Public Library. By the 1850s, the Gooderham and Worts distillery had expanded to include flour mills, a wharf, the distillery, a cooper shop and a dairy. The five-story limestone distillery building was constructed in 1859 on Mill Street east of Parliament. In 1869, a fire destroyed the wooded interior of the main distillery building but left the limestone exterior intact. Despite this financial setback, the company continued to grow. By 1871, the Gooderham and Worts Distillery produced almost half of Ontario’s total spirits and exported whiskey and spirits to markets across Canada, the United States and South America. Cattle operations also expanded: relocated to vacant land east of the river and south of the GTR line in 1866, by 1880 the Company’s seven cattle sheds could accommodate over four thousand cows. Ingenious in their efficiency, company owners constructed a pipeline alongside the railway track to convey the grain swill from their Trinity Street distillery to the cattle sheds east of the river. 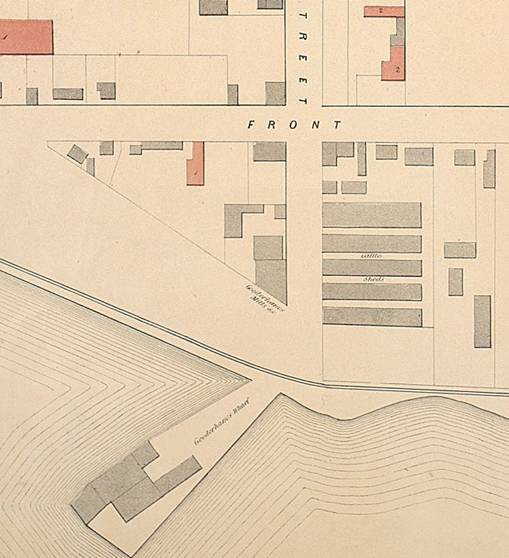 Detail from “City of Toronto, 1893.” The Gooderham & Worts cattle sheds are immediately east of the bend in the river, north of the marsh. Toronto Public Library, TRL, Historical Picture Collection, 916-2-1. William Gooderham and James Worts Jr. died within a year of each other in the early 1880s, leaving the distillery business to heir George Gooderham in 1881. The next two decades, however, would be hard on business. Canada's short-lived prohibition era brought alcohol production to a standstill. During World War One, the distillery converted its operations to manufacturing acetone in order to support the war effort. In 1923, the Gooderhams sold their controlling interest, and two years later merged with the Hiram Walker Company to form Hiram Walker-Gooderham & Worts Ltd. While the bulk of operations shifted to their plant in Windsor, Ontario, the Toronto distillery continued to produce small amounts of Gooderham & Worts-brand whisky and rum throughout the twentieth century. 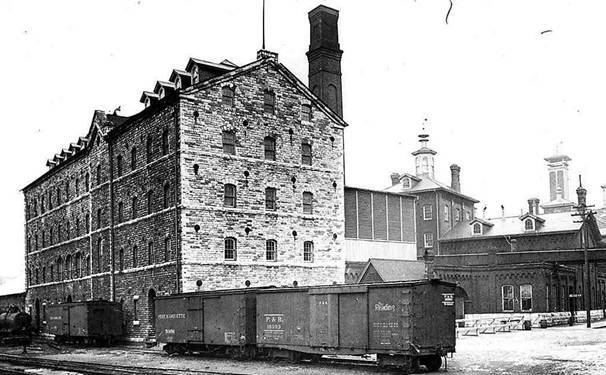 Gooderham & Worts Distillery, c.1917. City of Toronto Archives, Fonds 1244, Item 3061. The Distillery closed in 1990, after 153 years of continuous production. During the 1990s, the Distillery became the number one film location in Canada, and the second largest film location outside of Hollywood. In late 2001 Cityscape Development Corporation and Wallace Studios purchased the 13 acre property for $15 million, and began a massive restoration of the site. The Distillery District opened in May 2003 as a pedestrian-only village entirely dedicated to arts, culture and entertainment. 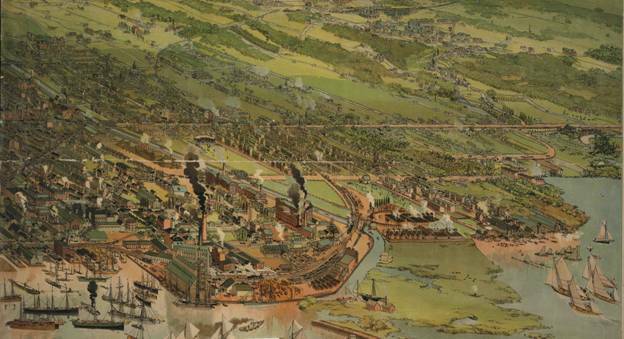 The site contains the largest and best preserved collection of Victorian Industrial Architecture in North America. Newell, Diane, and Ralph Greenhill. Survivals: Aspects of Industrial Archaeology in Ontario. Erin, ON: Boston Mills Press, 1989. Toronto Historical Association and The Maps Project, City of Toronto Urban Development Services, A Glimpse of Toronto's history: Opportunities for the Commemoration of Lost Historic Sites (Toronto: Toronto Historical Association, 2002.